Tue., Jan. 10, 2017, 2 a.m.
Jacksonville’s coaching search landed someone from its past and present. The Jaguars (3-13) also gave general manager Dave Caldwell a two-year contract extension. So Marrone, Coughlin and Caldwell are now signed through 2019, giving the new regime a three-year window to, at the very least, make Jacksonville relevant in the AFC South. Marrone and Caldwell will report to Coughlin, meaning Jacksonville’s first coach is now in charge and will have final say in personnel decisions. Marrone is the fifth head coach in franchise history, following Coughlin (1995-2002), Jack Del Rio (2003-11), Mike Mularkey (2012) and Bradley (2013-16). “I think Doug has earned the respect of the offensive players, and I’m excited for him to get this opportunity and the direction of this team,” quarterback Blake Bortles told AP in a text message. Coughlin, a winner of two Super Bowls in 12 seasons with the New York Giants, will serve as executive vice president of football operations. Coughlin, who led the Jaguars to four playoff appearances in his first five years, will have final say in the NFL draft and in free agency. Caldwell has been the primary decision maker in all personnel moves the last four years. Khan, who hired Jed Hughes of Korn Ferry International to help with the search, also interviewed Atlanta offensive coordinator Kyle Shanahan, Tampa Bay defensive coordinator Mike Smith, New England offensive coordinator Josh McDaniels and Arizona offensive coordinator Harold Goodwin for the head coaching job. Marrone and Coughlin could provide that. They surely will bring a different vibe, a much more disciplined approach that will put more emphasis on winning games than Bradley did. “I can see what they’re doing,” veteran tight end Marcedes Lewis told AP. “These are good moves for a young team, a team that needs to be held to a certain standard. Marrone’s a good man. He’s good for the culture. Marrone likely will keep offensive coordinator Nate Hackett, providing some stability for the inconsistent Bortles. The 2014 first-round draft pick has had three play callers in three seasons. 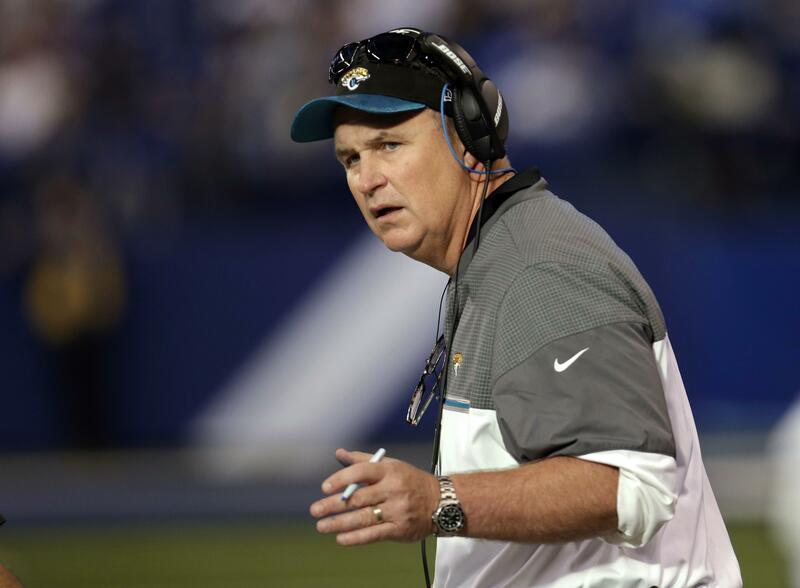 Marrone has been Jacksonville’s assistant head coach/offensive line coach since January 2015. He joined the team after two seasons as Buffalo’s head coach. He guided the Bills to a 15-17 record before opting out of his contract because of uncertainty over potential organizational changes. The Bills went 9-7 in Marrone’s second season in 2014, the franchise’s only winning record since 2004. The 70-year-old Coughlin led the Jaguars to a 68-60 record in eight seasons. Coughlin resigned last January after a dozen years with the Giants, but made it clear he wanted to return to the NFL. He served as a senior adviser to the league’s football operations department this season. Published: Jan. 10, 2017, 2 a.m.